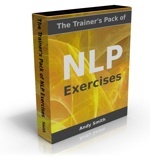 Several years into my career as an NLP trainer, I still wasn’t a confident presenter in a business context. Even with a decade of experience as a therapist helping all sorts of people, from bus drivers and students to millionaires and CEOs, to deal with often serious problems, I would get nervous doing talks and running in-house training courses to corporates. Consequently I didn’t seek out that kind of work, and didn’t get much of it, though I would take it when offered. Of course I had various state management techniques available to me to cover up the appearance of nerves, but it still took effort to apply them. Nowadays, I’m quite happy working in corporates at any level. So what’s changed? Just one thing – I’ve done a lot more of this kind of work, and so have built up a collection of positive reference experiences where things went well. The more work I did, the more confident I felt. This may seem obvious – but there are things you can do to accelerate the process of building up your confidence through experience. First, a quick bit of theory. In his brilliant book, Transforming Your Self, veteran NLP developer Steve Andreas looked at how we construct our ‘self-concept’ – our image of ourselves. He found that our internal representation of ourselves as having any particular quality (e.g. being a credible presenter) has a structure. How confident you feel about having that quality comes from how strong and vivid your internal representation is – and there are things you can do to strengthen the structure. You know the answer to that straight away. The chances are that some image (or sound, or feeling) symbolising your kindness immediately came into your mind. This is your brain’s shorthand or summary representation for that quality – any time the question of kindness comes up, you can access the image quickly and easily so you don’t have to take any time to think about it. Now if you ask yourself: “How do you know you are kind?” and give yourself a moment to answer… what comes into your mind in response? I’m guessing that you will be recalling actual memories of times when you showed kindness. These are like a ‘database’ of reference experiences supporting your initial answer. Other things being equal, the more memories you have of being kind, the more strongly you will feel that you have that quality. So far, so obvious – the more experience you have of doing something, the more confident you feel about it, right? Except that sometimes it’s not as easy as that. Have you ever known someone who had a good quality that everyone else recognised, but they didn’t? Or someone who was good at something, but always downplayed their own skill, and seemed to be their own harshest critic? What’s going on there? A couple of things. Firstly, if our reference experiences are not vivid and compelling, they won’t have much effect on how we feel. In NLP terms, the ‘submodalities’ (qualities) of the memories need to be ‘turned up’ in order for our brains to accord them importance – so memories we experience as small, grey, still pictures will have less impact than those we relive as big, bright, colourful movies. Someone could have lots of experiences that could support their confidence, but they won’t register much if they are not remembered vividly. Secondly, if we don’t recognise the experiences as being examples of that quality, they won’t get stored in the right ‘database’ to start with. Someone could have a lot of potential examples of being ‘assertive’ (a quality that they would approve of) but if their mind is filing the experiences as examples of being ‘selfish’ (a quality they would disapprove of), they wil feel worse rather than better about these experiences. Looking back now to my previous life as an IT consultant, I had a lot of experiences that could have taught me a lot about effectiveness in the corporate world, but because my attention was focused elsewhere, I didn’t learn that much from them. Finally, we can also learn from counter-examples – times where we didn’t show that particular quality. One of findings that surprised Steve Andreas when he researched self-concept was that a ‘robust’ self-image (one that is open to feedback, accurately reflects the person’s competence level, and doesn’t collapse when it is challenged) will include a few counter-examples as well as lots of examples. These counter examples help you to know what not to do, and to recognise and correct any times when you are not showing your desired quality. I accumulated quite a lot of these experiences in my former career! Following the processes that Steve Andreas outlines, I can go back through them and take the learnings from them, and at the same time tone down any embarrassment or emotional discomfort associated with them. For any quality or skill that you want to develop, go back through your life and find examples of when you showed this quality or skill. Write a paragraph or more about each memory. What happened? What was important about it? What did you learn from it? The more vividly you write about it, the more strongly it will be represented in your memory. Extra tips for this exercise: if, after giving yourself a while to remember, you don’t find any examples where you showed the quality yourself, write about episodes you have witnessed where other people showed the quality. Also, when you have few positive examples written down, you can also use counter examples to strengthen the quality. What did you learn from each of those experiences? What will you definitely do differently next time if a similar situation arises? To develop your confidence more, what could you do that will be a stretch in that area, but not too much of a stretch? For example, many people become more confident public speakers by joining their local branch of Toastmasters and developing their skills with a supportive audience. This is a less risky route than starting off by addressing a large, skeptical audience straight away.